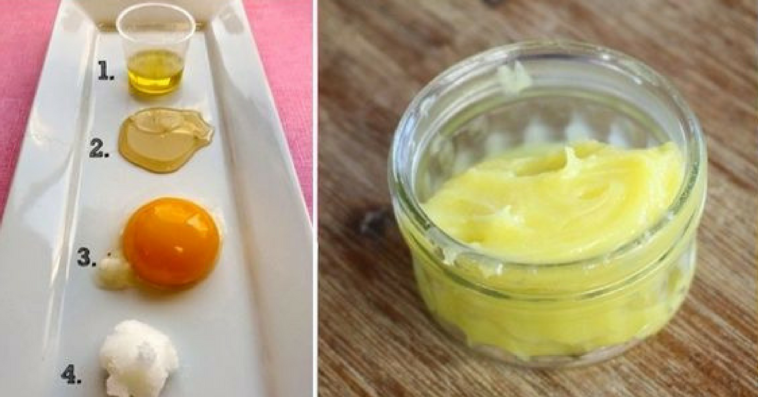 Take 2 tsp of pharmaceutical Vaseline and heat it in the microwave for 20 seconds. Add 1 tsp of honey, 1 yolk and 1 tbsp of olive oil to the melted pharmaceutical Vaseline. Mix it well to get a homogenous mass. Pour the cream in a box of face cream in order to store it well. Now, take some cream on your fingertips and provide a gentle massage with it to your face skin. Leave it for 30 miuntes and later remove the excess cream from your face using a cotton pad soaked in water. Use this cream daily to get a wrinkle free and glowing skin. It takes more than 1 hour for the cream to get absorbed in the skin. So, apply it 2 hours before the bedtime. Store the face cream in the refrigerator so that you can use it for a longer time. The double dose of this cream will not go bad. It is all natural and you can use it twice a day. Use this cream regularly and you will fall in love with your skin!